Posted by Telangana Utsav in Nizamabad, Telangana Places. Little known Koulas fort dating back to the fourteenth century, spread across six square km and tucked away in a corner of backward Jukkal mandal of Nizamabad district, has the potential of becoming a much sought after tourist destination. Posted by M Bharath Bhushan in agitation, compromise, conflict resolution, Congress, elections, Harish, Identity, Medak, Mulki, Nizamabad, politics, regionalism, TDP, Telangana, TRS. 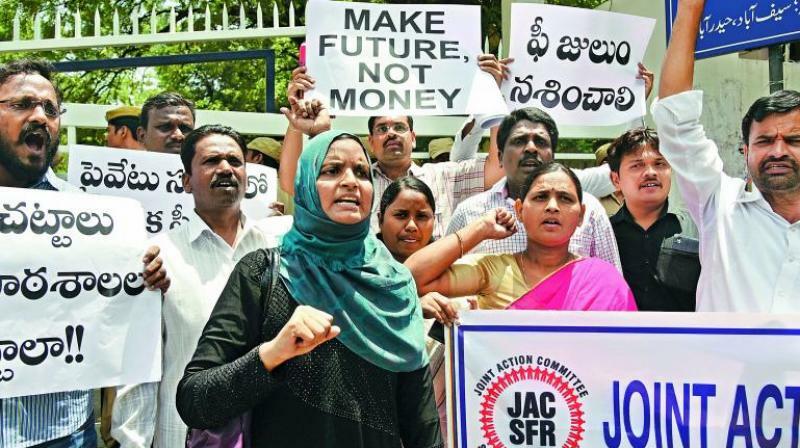 April 24: Lack of leadership and perennial dissidence and revolts against the party high command have adversely affected the activities of the Telangana Rashtra Samiti (TRS) in Nizamabad district. Since its inception in 2002, the party has been losing its sheen gradually. TRS founder members and senior leaders are leaving the party and joining other political parties. It may be noted that leaders and activists of Nizamabad had extended strong support to the TRS in the initial days. TRS chief K. Chandrasekhar Rao was unable to show his party’s strength in his native Medak district in the 2002 local body elections, but people of Nizamabad voted for the TRS and gave a chance for the Zilla Parishad chairman’s post and 23 out of 36 mandal parishad presidents’ posts. TRS leaders S. Santosh Reddy, G. Sadanandam and G. Anita served as zilla parishad chairpersons for two terms. Former TRS MLAs S. Santosh Reddy of Armoor and G. Ganga Reddy of Dichpally resigned from the party and joined the ruling Congress. Posted by Telangana Utsav in Adilabad, BJP, Congress, elections, Identity, JAC, Karimnagar, Medak, Mulki, Nizamabad, politics, regionalism, Sonia, TDP, Telangana, TRS, Warangal.